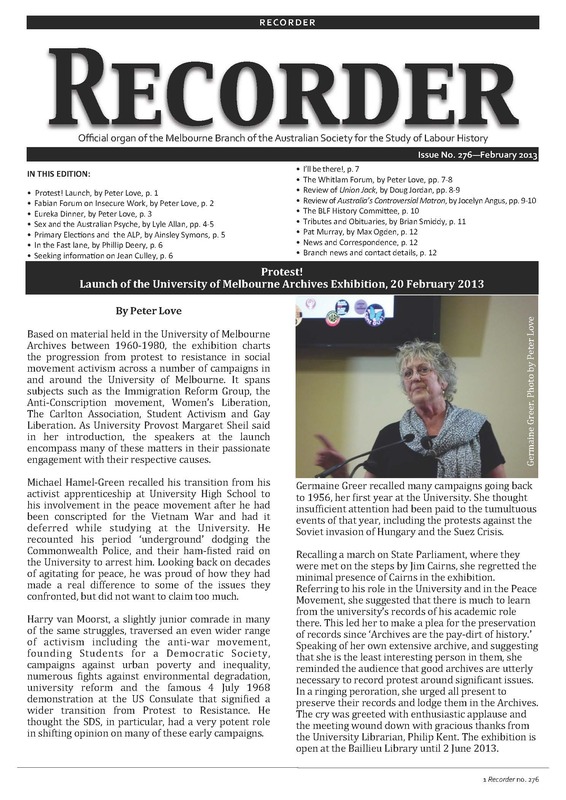 Recorder is edited by Julie Kimber and is published three times a year. If you would like to publish an article in Recorder please contact the editor. The Eighties, James Walter, pp. 1-2. Liquor Laws and Alcohol Control in Victoria, Ainsley Symons, pp. 2-3. The Pearl Frontier, review by Heather Goodall, pp. 1-3. An Exercise In The Historical Subjunctive: What If America Had Built A Mass Labor Or Socialist Party?, by John Tully, pp.1-3. Reflection On ‘Australia’s Welfare Wars’, by Rob Watts, p.3-5. Proofreaders at the Age, by Val Noone, p. 1. John Corsetti, by the Corsetti family, pp. 6-7.